William Henry Holmes, 1920. Smithsonian Archives collection, SIA2008-3015. From November 28th through December 9th, the Smithsonian Libraries, Smithsonian Institution Archives, Biodiversity Heritage Library, Smithsonian Field Book Project and Smithsonian Transcription Center will host the #ManyHatsofHolmes transcription event. Help us transcribe the digitized volumes of William Henry Holmes’ Random Records of a Lifetime, 1846-1931 to discover more about his expeditions, adventures and his Smithsonian days. Throughout the campaign, we’ll take a deeper look at Holmes’ life through particpating blogs and share updates on social media with the #ManyHatsofHolmes hashtag. 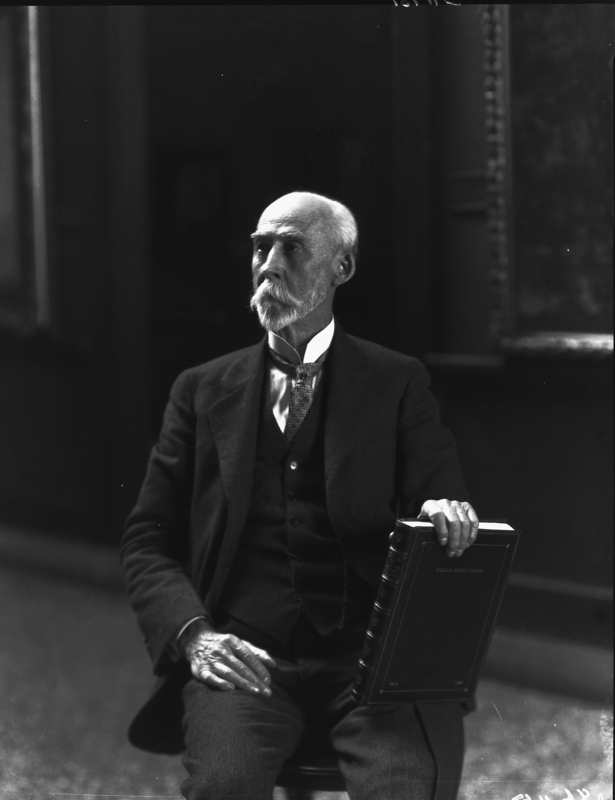 William Henry Holmes was the curator and director of the Smithsonian’s National Gallery of Art from 1906 until his retirement in 1932. During the entirety of his career in these positions, he fought for independent recognition and a home for the Gallery. But due to indifferent leadership, Congressional economizing, and other unfortunate circumstances, the Smithsonian’s National Gallery of Art gave away its name and the collection waned without its own building until 1968. The National Gallery of Art of today, founded by generous donation of Andrew Mellon, sits on the National Mall between 3rd and 7th Streets in northwest Washington D.C., its two buildings sharing the same stretch of lawn as nearly a dozen Smithsonian museums. Although many tourists confuse the two, the National Gallery of Art today is not under the umbrella of the Smithsonian Institution, and has been a separate body for most of its history. But the very first iteration of a “National Gallery of Art” was indeed a part of the first Smithsonian National Museum, and had an interesting history from its inception until it changed its name in 1937 (first to the National Collection of Fine Arts, then much later to the Smithsonian American Art Museum), in deference to the brand new museum funded by Andrew Mellon. 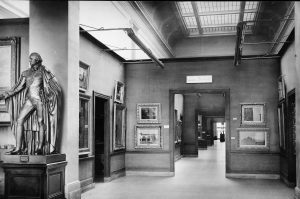 The genesis of a National Gallery of Art started to form in the 1820s before the Smithsonian Institution was even founded, and in 1906 its collections became a distinctly named department within the Smithsonian’s National Museum. Paintings and sculptures in the Natural History Building, 1911, with a plaque reading “The National Gallery of Art” above the door. Smithsonian Archives collection, 94-12610. Holmes was appointed the first curator of the Smithsonian National Gallery of Art in 1906 after the esteemed gift of the art collection of Harriet Lane Johnston. The Gallery remained a department in the larger Smithsonian National Museum, presenting its expanding collection within the halls of the Arts & Industries Building and later the Natural History Building, among the museum’s other scientific specimens, anthropological artifacts and antiquities. In the early years, Holmes continued his work as curator of anthropology at the National Museum and the Chief of the Bureau of American Ethnology while also caring for the art collections. But despite a strong start, the reality of the lack of government support for a building and acquisition funds soon became apparent. The Gallery had limited space to host rotating exhibitions and its permanent collection, and was unable to grow its collection through purchases. After a time, the lack of space meant that the Gallery had to limit the gifts it could accept, with no storage or staff to care for them. Secretary Walcott died in office, and his successor did not have the same interest in the arts. 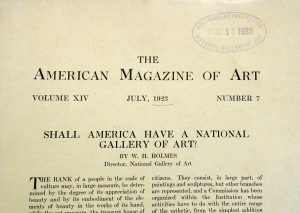 In 1923, William Henry Holmes had begun an impassioned campaign to create a home for the National Gallery of Art, writing letters to the most significant contemporary art journals of the day, presenting to audiences at meetings and conferences, and even speaking to a radio audience. Holmes said he saw the appeal as publicity, “bringing…knowledge of the unfortunate state of our national art to the attention of the American people.” While there were numerous significant collections of artwork in the United States and in Washington D.C., and the Smithsonian itself had a brand new art museum in the Freer Gallery of Art, none of these constituted the weight and importance of a “national collection” administered for the American people, as the founding documents of the Smithsonian had intended. 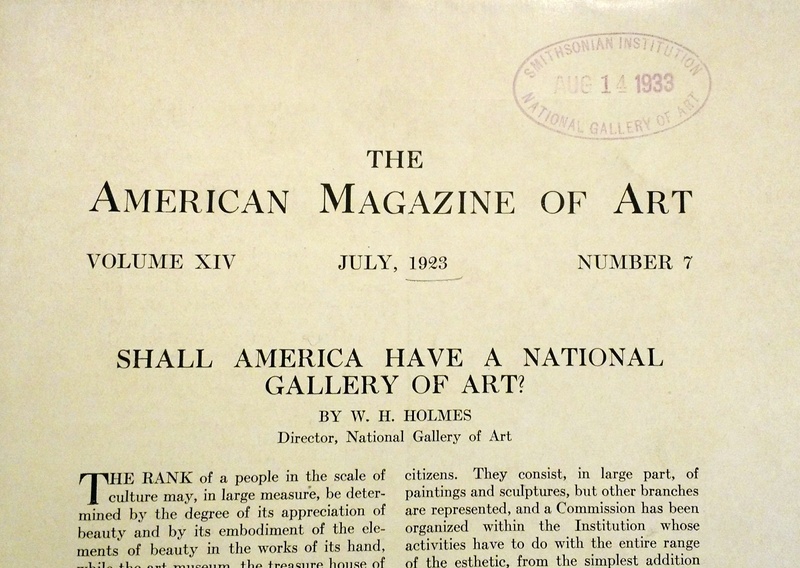 Holmes, in his 1927 Plea for a National Gallery of Art, warned that “the capital of the nation will, from the lack of a gallery building, mourn a lost opportunity and remain indefinitely in esthetic poverty.” His own scrapbooks, the Random Records, show he had hope through promising leads and possible donors until the end, but none came to fruition. 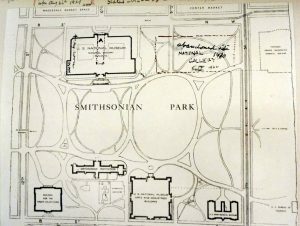 Plan of the National Mall, showing pen drawings by Holmes. The marginalia note that his first drawing here was 1926, but by 1929, he had added the words ” Abandoned site” above the National Gallery of Art. When William Henry Holmes retired from the Smithsonian Institution’s National Gallery of Art in 1932, he had devoted more than half a century to the Institution, as Anthropologist, Archaeologist, Artist, Ethnologist, Explorer, Geologist, Government Bureaucrat, Museum Curator, Director, and Scientific Illustrator. But he was unable to see his vision for a Smithsonian National Gallery of Art fulfilled. Andrew Mellon gave his gift to the nation in 1936, three years after Holmes’ death, and under dubious conditions. The government bestowed the title of National Gallery of Art on this new and autonomous collection, and it took another 30 years for Congress and the Smithsonian to provide a home for the nation’s first art collection, when the former Patent Office Building was christened the National Collection of Fine Arts and the National Portrait Gallery. 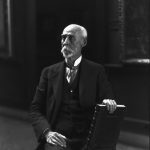 Today, the origins of the Smithsonian’s art collection and the great work of William Henry Holmes are continued as the Smithsonian American Art Museum. Holmes, William Henry. “Plea for a National Gallery of Art.” Art and Archaeology. February, 1927. pp. 51-69. Holmes, William Henry. Random records of a lifetime, 1846-1931 [i.e. 1932] Cullings, largely personal, from the scrap heap of three score years and ten, devoted to science, literature and art. Multiple volumes. Fink, Lois Marie. 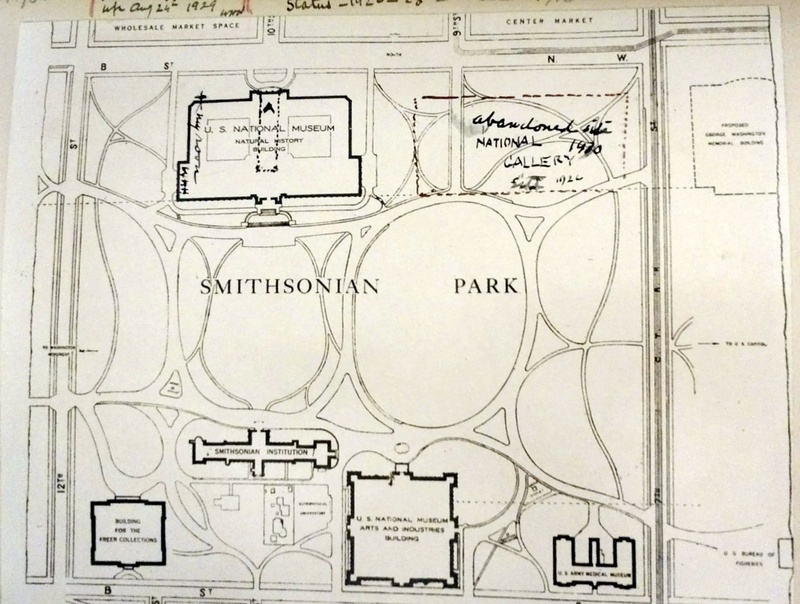 A history of the Smithsonian American Art Museum : the intersection of art, science, and bureaucracy. Amherst : University of Massachusetts Press, 2007. Fink, Lois Marie. The history of the first national gallery of art : manuscript on pre-Smithsonian sources : first part of a projected history. 1979. Next Post Secretary Skorton Adopts Books! This is fascinating. I wonder what would have happened if Walcott had not died and Abbot did not take over? At almost exactly the same time (1927) Abbot was confronted with a proposal to build a planetarium at the Smithsonian as the first in the US – a National Planetarium. Zeiss patrons even found a potental donor. Despite Abbot’s claimed intrerest, and encouragement from one of the Regents, Delano, nothing happened. Abbot claimed there was too much to do in the way of managing SI at a time of dwindling gov’t support. Yet he was able to establish his Department of Radiation and Organisms in 1929.